He wears Creeds Royal English Leather, but I'm going to find a sample of this for backup. By the way...you have to have read all of the Diana Gabaldon series? Jamie Fraser? The ultimate fantasy that you're describing? 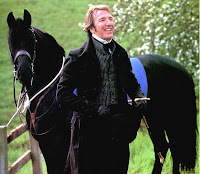 Alan Rickman in riding togs? Woof! I have to go re-sniff Greyland now. I know it was on my lists of nust-gets..
Hi Beth, thank you! I was truly inspired by this fragrance. I am pretty sure you will love it too. And your own personal dream man will smell fabulous in it! Tom, it should be on every man's short list - and every woman's too, IMHO. Wonderful post! And I absolutely must go find my sample of Greyland. I'm wondering now if I ever even tried it or if it just got lost in a sample pile somewhere. Sounds divine! Ahhh, Greyland. It's beautiful in a stark, unforgiving way. All the more so if you smell it in a Montale boutique, drunk on Aoud and Roses - SUCH a contrast. It's really a high mountain landscape: stone and snow and sky, and a cold, bracing wind. Utterly bare, utterly beautiful and about as non-opulent as you can get. Love it. Even though, as a rule, I'm an opulence lover. But who says you can't love both bare and lush? Dinazad, I had the exact same feeling when I first tried it, alongside Aoud Queen Rose and the others - it was quite startling! I love opulence too, but this one, as full of open space as it is, seems to fill up a space in me that I didn't even know needed filling until I smelled it. You have a great way with words - and this is a really wonderful blog. It is also very good to hear that somebody is still a true romantic, which you do indeed seem to be. Many Thanks for this blog, and indeed, all the posts on it. Bopnews, thank you for your very kind words! Marina graciously allows her guest writers to express themselves here, and of course she is also a very talented writer herself. Thanks for this review: you've made Greyland sound like a must-try. I find the quality of the Monatale Aouds I've tried to be superb, and I own a small bottle of Red Aoud. I really look forward to sampling this one.